Tidy Up! 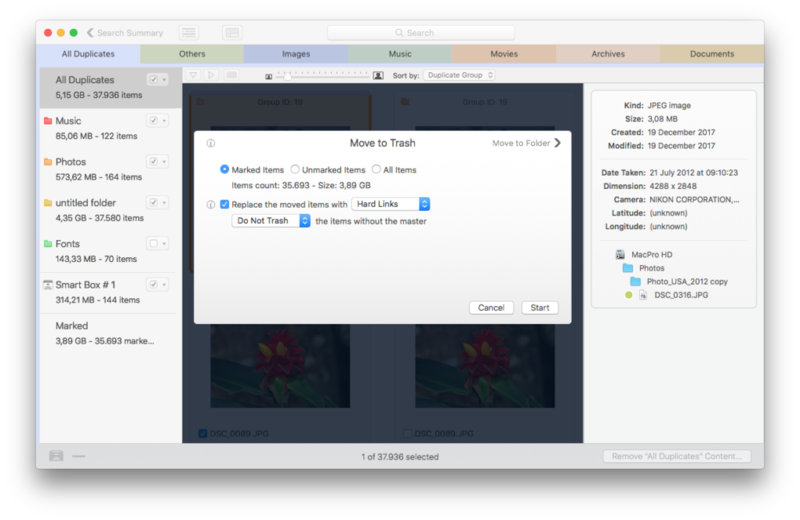 is our next generation duplicate finder and disk tidiness utility. With Tidy Up! you can search for duplicate files and packages; by the owner application, content, type, creator, extension, date modified, date created, name, label, visibility and more. You can also search by the tag, duration and bit rate of MP3s and AACs audio files, search the content of the iTunes and iPod dababases, and synchronize deletions with iTunes. Tidy Up! is fast, from 20% to 50% faster than the already fast Doublet Scan. With its multitasking capability, you can do more searches at a time and take advantage of the latest Macintosh computers and operating systems. Tidy Up! has a security system that assures you to keep at least an item of the duplicate group on the disk. Of course Tidy Up! allows you to trash, move, burn and export into html files all found items. Tidy Up! is fully customizable and allows you to create your preferred workspace. Search for duplicate folders by content. Search only in the preferred playlists and albums. Compare only the representation data of the images. Result shown as a grid or list. New pre-defined smart baskets which show the files by kind.